The Fourth Degree Uniform website is officially live and functional and ready to accept orders! 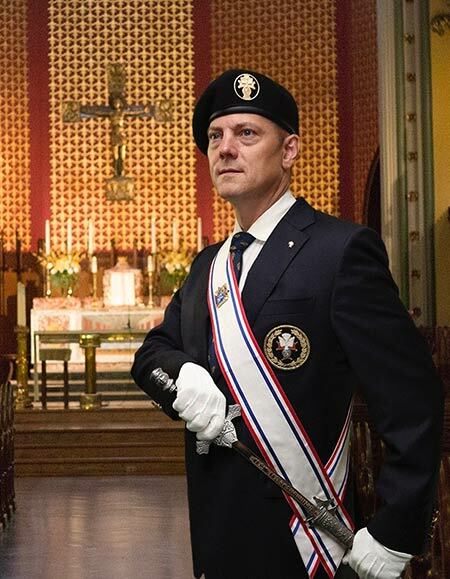 It can be found at www.kofcuniform.com. and you to order your colored patch for your beret. The orders were delivered the week they ordered the uniform. This is a quick turnaround. Knights no longer have to wait six months for their orders. Supreme Master Dennis J. Stoddard and vice supreme masters wearing the new Fourth Degree uniform process during the opening Mass of the 135th Supreme Convention Aug. 1st. Right: A Fourth Degree Knight wears the new uniform with the interior of St. Mary’s Church in New Haven, Conn., seen in the background. 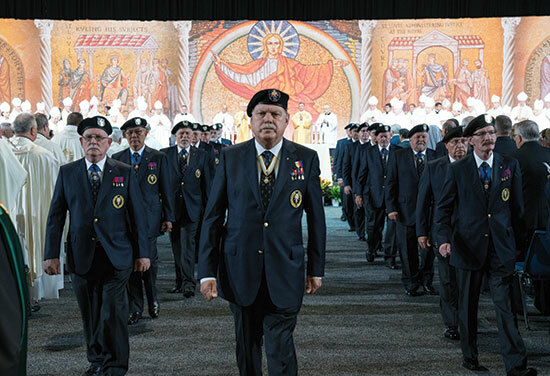 At the opening Mass of the 135th Supreme Convention in St. Louis, the Order’s vice supreme masters processed wearing the new uniform of the Fourth Degree: a blue blazer, blue tie and a black beret — all with the Fourth Degree emblem — worn with a white shirt and dark gray slacks. Supreme Knight Carl A. Anderson officially announced the change in his annual report that afternoon. *consistent reports that the old regalia presented a barrier to Fourth Degree membership. Understandably, some members may prefer the old regalia, but the supreme master and vice supreme masters urge all Fourth Degree members to put the good and unity of the Order before personal preference. Below are frequently asked questions that have arisen concerning this change. Will the new uniform allow the use of ceremonial swords? A: Yes. Ceremonial swords will continue to be part of the Fourth Degree. When swords are used, gloves should also be worn (see picture to the right). How will rank be distinguished? Where can I buy the new uniform? A: The uniform can be purchased at knightsgear.com or by calling 1-855-GEAR-KOC (855-432-7562). Is the Order making money on the new uniform? A: No, the uniform is being sold at (or sometimes below) cost. What if a member just purchased the old regalia? Can the old regalia (Legacy Regalia) still be worn? A: Yes, for a time. While the preference is for the new uniform wherever possible, the old regalia can still be worn until the end of the current fraternal year June 30, 2018. (The deadline for using the new regalia is being extended by one year to June 30, 2019) After that date, only the new uniform should be worn. Was the new uniform field tested prior to its release?